This puts many of the other films about the Beats to shame. Make sure you Don’t… Miss… This one, if you’re a fan. Well, okay. I’m a big Ginsberg fan. I loved James Franco’s portrayal/characterization. It’s very believable, in a lot of ways. Even if it was only because I wanted to believe it. Everything was well researched and thoughtfully put together. It had a clear point of view about Ginsberg – I liked that. Maybe they gilded the lily, somewhat – but so what? Ginsberg stands up to it. He deserves to be romanticized. What comes through, though, is: self assurance; belief in self; an inspired authority about writing; and a human quality. The film itself is quite an achievement. Filmed on a shoestring budget, it captures the mood and flavor of the times and subject. It distills things down to a few essential events, ideas and elements. It incorporates courtroom drama, ‘interviews with Ginsberg’, ‘flashbacks’ and animation – all very effectively, masterfully. Great stuff for film buffs and students. And hey. It’s just a really good, fun movie. If you’re interested in writing, you’ll want to see this. Listen to the commentary, too! Virtually every bit of dialogue was culled from interviews and court records. The court scenes – kind of unbelievable! But it wasn’t so long ago. 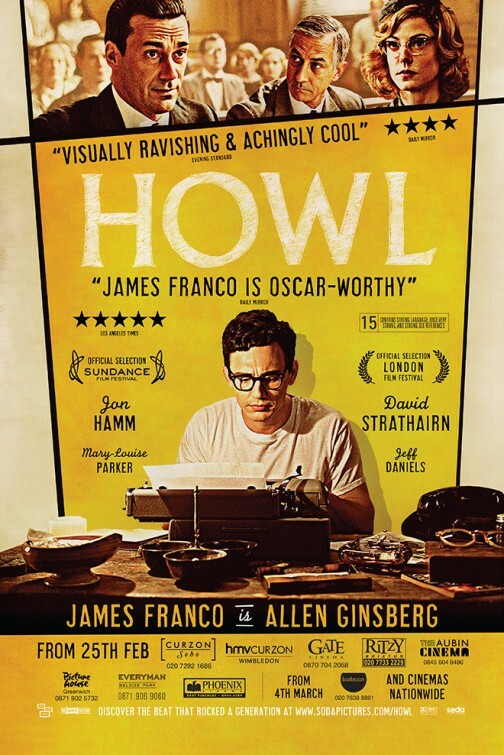 Coming out of the McCarthy era and the repressed Fifties, the uproar and trial over the publication of Howl was a game-changing watershed in American law and free speech. Amy, Sound like a great movie. Hope to see it at Liberty Hall this Spring. I’d be off to see this film in a heartbeat if we still had a cinema in this corner of Scotland – it’s closed for renovations until 2016. And Glasgow is 4 hours away. Anyway, happy new year Amy.